Fairytale Dreams and Destinations > Blog > Fairytale Dreams & Destinations > Vacation Specialists > Meet Miranda! Miranda’s first trip to Walt Disney World was in 2000 with her family, and then went on to enjoy other exciting Disney vacations! 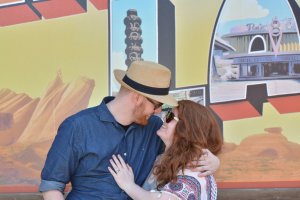 One trip that was extra special was when her husband (then boyfriend) popped the question, and they spent the day celebrating at Disneyland! When staying at Disneyland Resort, Miranda’s first choice of hotel is Disney’s Grand Californian Resort & Spa. With all of the beautiful art, architecture, and an amazing pool, it’s easy to see why! At the theme parks, you can find Miranda being brave with the thrill rides and roller coasters, though Toy Story Midway Mania! is her favourite attraction at Disney California Adventure Park. 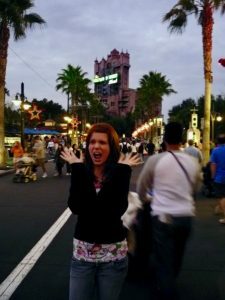 But back at Walt Disney World, Tower of Terror at Disney’s Hollywood Studios is her must-do experience. When she ventures over to Universal Studios Florida, no day is complete without a ride on Harry Potter and the Escape from Gringotts! While Kermit the Frog may have said “It’s not easy being green”, Miranda would have to disagree! Passionate about the environment, Miranda knows all the tips and tricks to help you have an environmentally friendly stay while on vacation. And when she’s not off saving the world, Miranda loves to spend quality time with her husband Jeff at home, cozying up with their two cats. Make sure to get in touch with Miranda for any questions about future Disney and Universal vacations.